IMPORTANT DISCLAIMER: This is a first draft. It is based on the Normal ("Rite of Passage") difficulty settings for Combat, Exploration, and Puzzles. I have attempted to provide useful strategy and cover all major collectibles with minimal backtracking, but these things take time. So there may be errors and less-than-optimal routes, etc. I hope you find it helpful and encourage you to check back for updates. After an exciting introductory cinematic, in which Lara and Jonah become separated when their plane crashes in the Peruvian jungle, we flash back to Cozumel, Mexico, two days earlier. 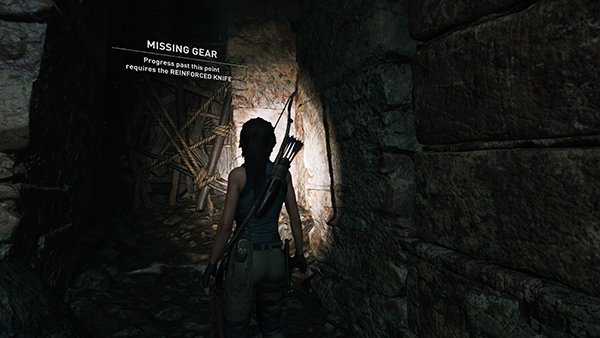 Lara is trapped by a cave-in. 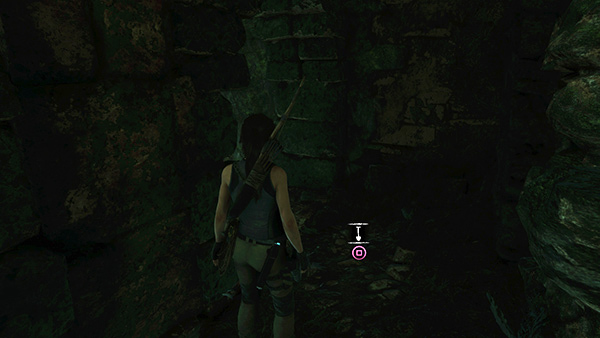 COZUMEL CAVES*: Follow the on-screen button prompt and tap Interact (E on the keyboard, Square on PS4, X on Xbox) to use Lara's knife to pry a rock off her leg. 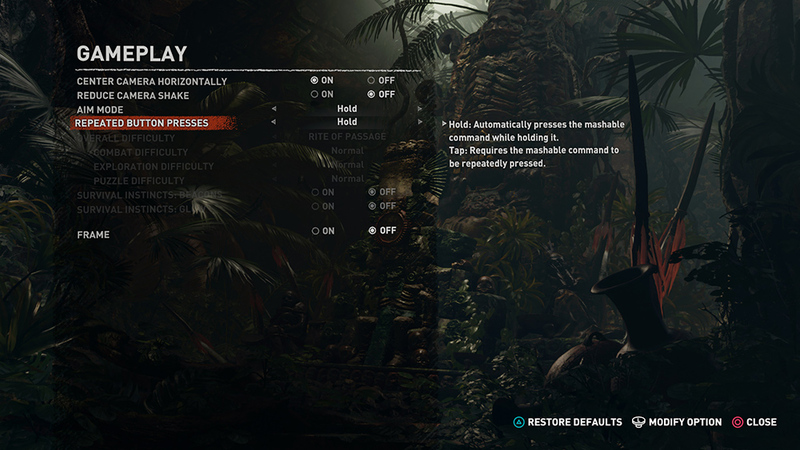 (Note that there is now a setting in the Gameplay section of the Options menu to Hold rather than Tap the required button for repeated presses.) Then, once Lara is free, press/hold Up to climb out of the passageway. 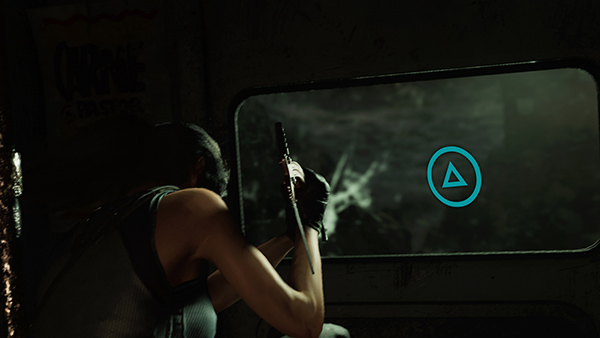 Lara bandages her wound and retrieves a second climbing axe from a dead Trinity operative. At this point, you also recover your first artifact: a Trinity Badge, part of the series Lara's Notebook. This happens automatically and is not counted as a relic in the total above. 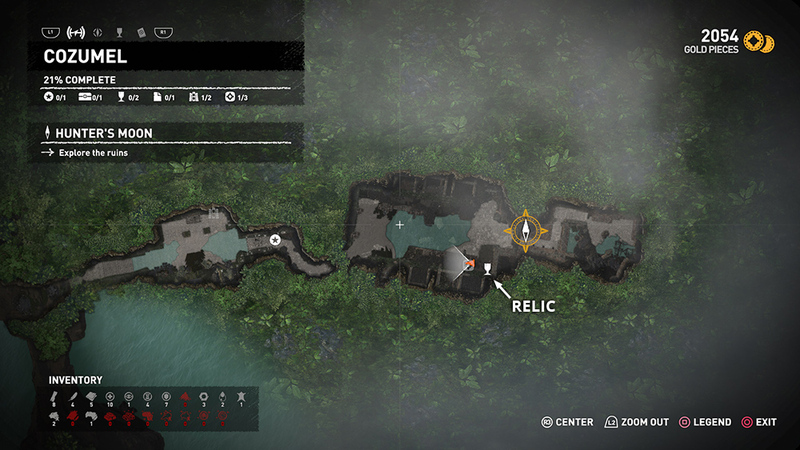 For more information, open the Artifacts menu by pressing Tab (PC), Touchpad (PS4), or View button (Xbox One) to access the Map. Then page twice to the right or select Artifacts, the chalice icon at the top left. Follow the on-screen prompts to move forward toward the climbable wall. As you go, Lara and Jonah speak over walkie-talkies. He tells her he's heard a rumor that a Dr. Dominguez will be in town for the Day of the Dead festivities. Continue following the prompts to latch onto the rough wall with your axes and climb up. At the gap, press Jump then latch onto the angled wall above. Continue following the prompts to Overhang Climb then, when you run out of wall, jump to grab the ledge above, then climb to the top. As you progress, you'll earn Experience Points (XP) for your efforts. As you earn more points, the sun-shaped meter on the left side of the screen gradually fills. When it is full, you'll earn a Skill Point, which we'll cover a bit later. You also start the game with 2,000 gold pieces, which you can see at the top right when you pause the game. At this point, there's nothing to spend it on, but you will collect more and later encounter merchants with whom you can trade. Follow the ledge around to the right, toward the area where the beam of light is pointing. As you approach the ruins, a cutscene kicks in. 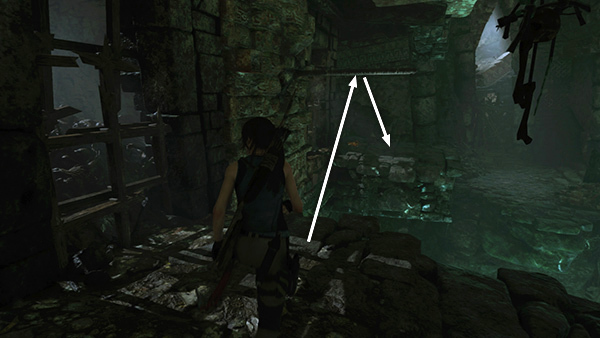 Lara examines the pyramid-like structure in the middle of the cavern. As she approaches, we see an explosive device attached to the base of the platform. Lara doesn't notice this. Jonah arrives and they discuss the possible significance of the carvings on the pyramid as Lara takes photos. She reads the inscriptions: Constellations...pink fish...a silver-crowned mountain...and a date that Lara suspects may have been damaged intentionally. Lara steps back to get a better look and accidentally triggers the explosives. Jonah urges her to move, as she continues taking photos to document the find. Jonah drags her to the exit and they escape in the nick of time. They regroup later that night in a cafe in Cozumel and watch as Dominguez arrives and takes a seat in the courtyard below. While they wait for him to make a move, they discuss the clues from the ruins. Lara pores over the photos and a map of the Amazon basin and decides the directions in the inscription lead to Peru. Soon, another man arrives and leads Dominguez away. 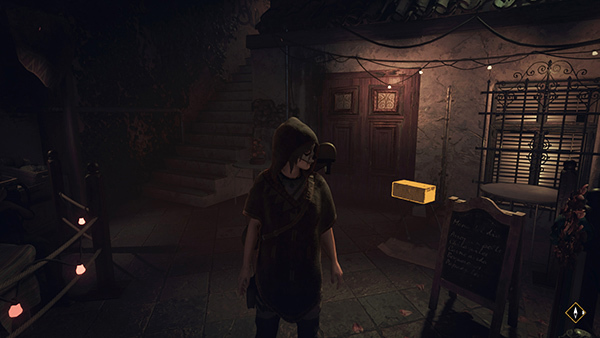 Lara dons a skeleton mask and follows at a discreet distance. FESTIVE TOWN SQUARE IN COZUMEL: In addition to following Dominguez, there are a few minor pick-ups in this area if you want them. For example, after you descend the stairs, if you turn around there's a medkit. Approach it and press Interact to add it to your inventory. 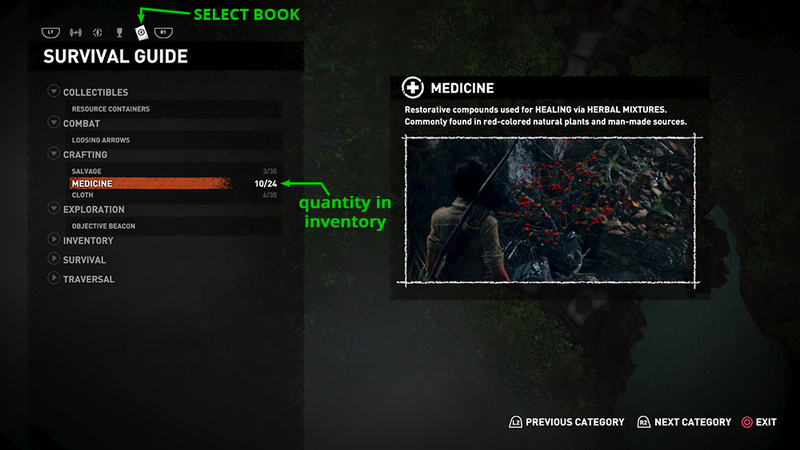 (screenshot) When you take this first item, the game prompts you to check the in-game Survival Guide, which is accessed from the Map screen. 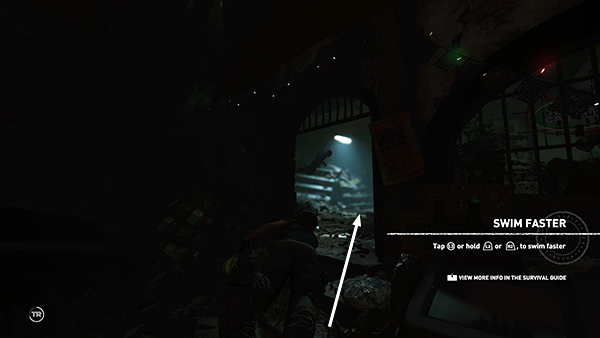 Press Tab (PC), Touchpad (PS4), or View button (Xbox One) to access the Map. Then select the first-aid book icon at the top left. You may also notice that 3 photos have been added to the Artifacts menu, under Path of the Stars. They are: Hidden City Riddle, Hydra Constellation, and Maya Date. There are more items to be found if you explore the courtyard, including a resource container (with random supplies inside) and a basket of medicinal herbs, both along the east wall; another basket of herbs in the northwest corner of the main courtyard; and resource boxes at the north end of the long alcove lined with candles on the west wall and behind the foodsellers' stall just south of the fountain. NOTE: You must have Survival Instincts: Beacons and Survival Instincts: Glow enabled (under Options > Gameplay) for these features to work. When you have everything, approach Dr. Dominguez and his men at the gate in the southwest corner of the courtyard. 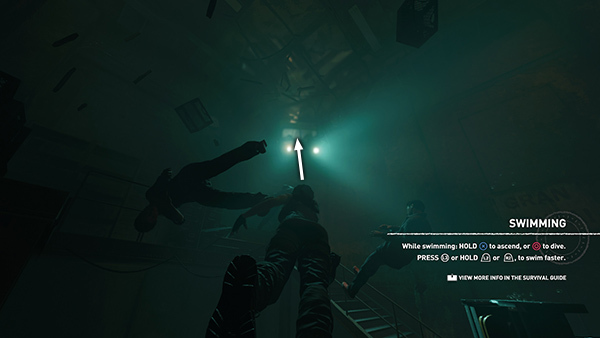 A brief cutscene shows Dominguez and his right-hand man leaving. 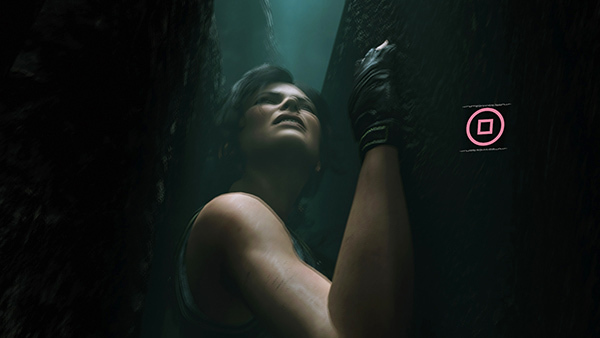 Lara finds another way over the wall while Jonah creates a diversion. After the cutscene, your goal is updated, and a photo of Jonah Maiava, is added to the Lara's Notebook series under Artifacts. Continue through the crowd into the GRAVEYARD. 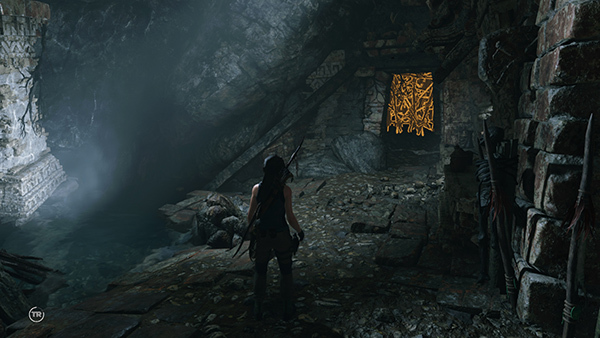 After Lara squeezes between the townspeople and moves down the stairs, there's another basket of herbs on the left, and another basket near the big wooden doors on the east side. As you proceed toward the exit, on the south side of the cemetery, Lara overhears Dominguez and his lieutenant talking and discovers that Dominguez is in fact the leader of Trinity, the sinister organization she's been pursuing for the past several years. BACKSTREETS: Continue southward along the street and into a back alley. You can't get lost here. Just follow the path toward the objective. As you go, Lara overhears the second man identify himself over the radio as Rourke. He tells someone to be on the lookout for her. At the end of the alleyway approach the low, brick opening to go through. Lara then sees the men enter the dig site and secure the gate behind them. Pick up some cloth lying on the ground to the left of the gate. (You'll find a use for this later. Just keep collecting any items you find.) Then continue along the deserted street to the south. When you reach the dead end, follow the on-screen prompt and press Jump twice to wall scramble over the wooden barrier. Lara lands on the other side, ditches her disguise, and takes out her trusty bow. She examines a carved mural nearby, which depicts a pyramid inside a cave. 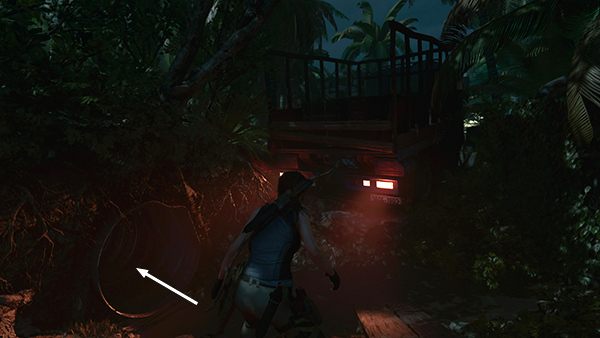 WEEDY ROAD NEAR DIG SITE: Lara adopts a defensive crouch, indicating there are enemies nearby. Head down the hill and into the metal culvert near the truck. (screenshot) Lara spots some low-level Trinity thugs threatening a local archaeologist. 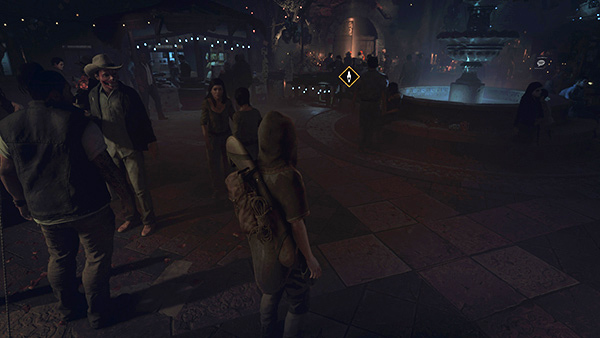 Follow the on-screen prompts and approach the first man and press Melee (F/Triangle/Y) to kill the first one with a stealth takedown (for which you receive more XP). She then advances and takes cover behind the wall on the left. Follow the prompts to draw the bow (hold Right Mouse/LT) then use the mouse or right stick to aim the targeting reticle at the second enemy. When you have him in your sights, briefly hold the Fire button (Left Mouse/RT) to charge your shot in order to make it more powerful. Then release the Fire button to loose your arrow. 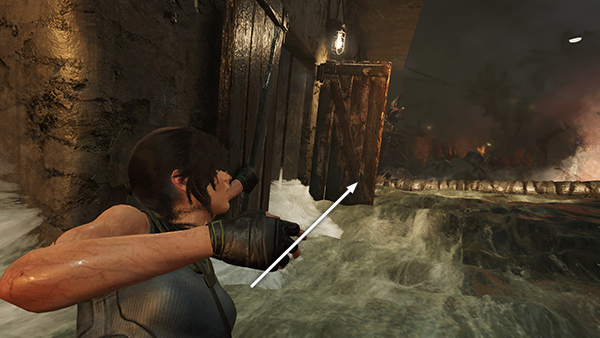 If you hold too long, Lara's arms will tire and she'll let the arrow fly. If you change your mind, release the Aim button, rather than the Fire button, to cancel the shot. A body shot will bring this low-level enemy down, but you'll get more XP for a headshot. 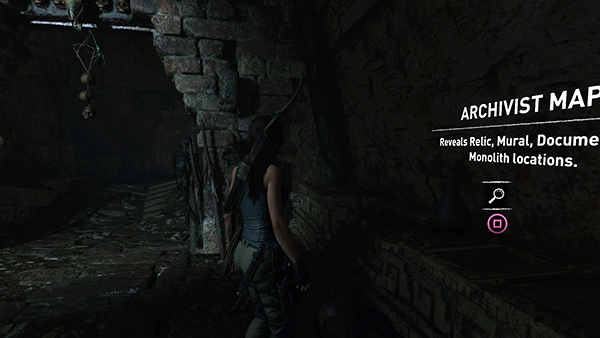 Once the two enemies are dead, Lara speaks with the archaeologist they had been threatening. He tells her they've found the temple entrance but he can't show her where it is because he must go and warn his sister. 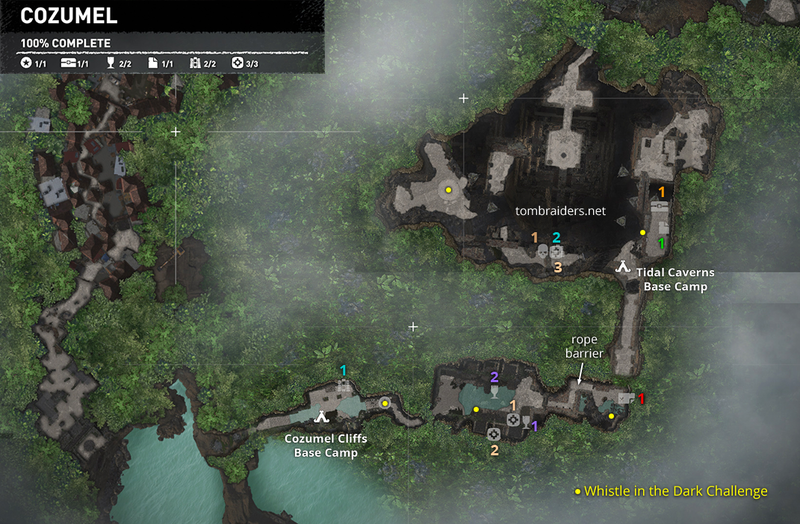 DIG SITE: Survival Instinct reveals more goodies hidden nearby, as well as the location of the temple entrance. (screenshot) If you turn around and head back toward the culvert where you came into this area, you can loot the body of the first dead enemy. 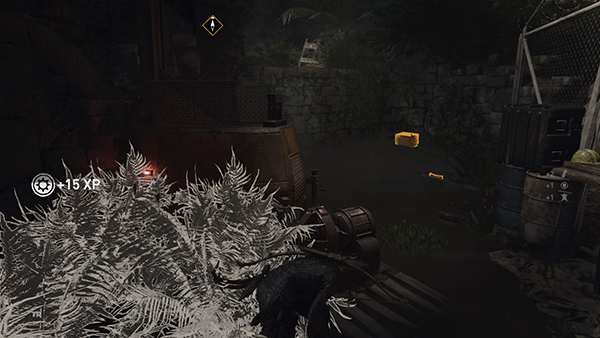 Stand over it and press Interact to take what he's carrying (screenshot), including some ammunition, some other random supplies, and a few gold pieces. Approach the stone wall to the southeast and follow the on-screen prompts to scramble up. 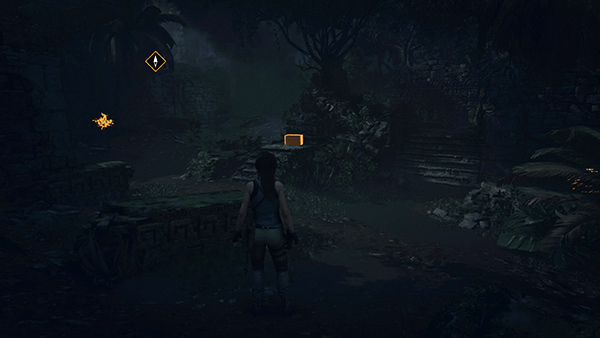 Lara discovers a two-sided stone marker, one side depicting Ix Chel, the Maya goddess of the full moon; the other side Chak Chel, goddess of the new moon. She deciphers an inscription: "Chak Chel...the key lies beyond her gaze." Lara's attention is then drawn to a skull-shaped rock formation a little ways offshore. CLIFFS ABOVE THE OCEAN: A photo, Ix Chel and Chak Chel is added to the section Lara's Notebook in the Artifacts menu. Like the previous unmissable finds, this is not counted as a "mural" in the tally for this level. When you move to the edge and face the climbable wall on the other side of the gap, the game prompts you to Axe Climb: Jump into the gap and press Interact to latch onto the craggy wall. Climb down as far as you can and you'll be prompted to Rappel. Hold either mouse or trigger button and press Down to begin descending with the grapple. Release the mouse/trigger button and continue pressing down to descend. 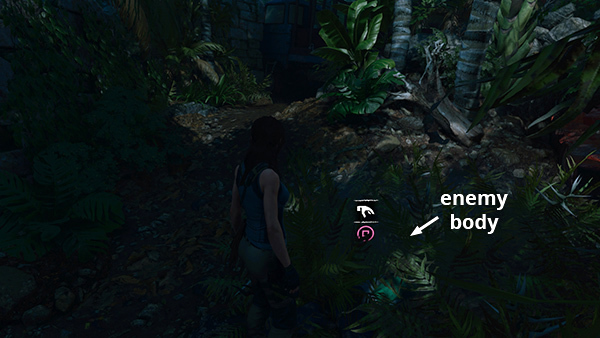 When Lara is close to the ground, press Drop/Roll (C/Circle/B) to Drop from Rappel. NOTE: I have not included screenshots here yet, since the game tells you what to do and you can't really get lost. If you're having trouble with any of this, feel free to give a shout. My contact info is below. Follow the path forward and downward. Take a running jump across the gap to grab the narrow ledge running around the stone column ahead. 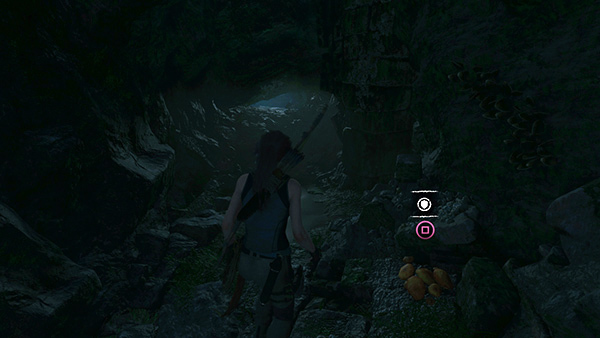 Here Lara may momentarily lose her grip and you'll be prompted to press Interact to make a Saving Grab. 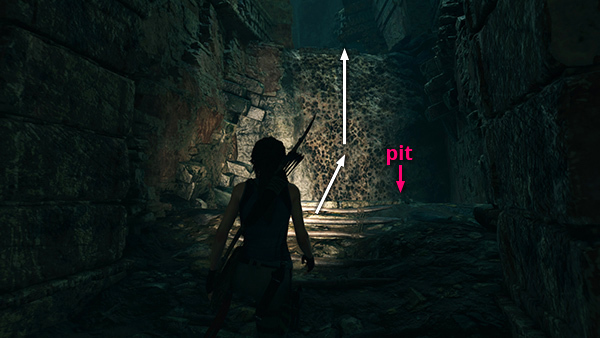 Climb around to the left until Lara leans out toward the next rough wall. As you go, Lara overhears Commander Rourke over the radio directing his men to secure the site and wait for Dominguez. Hold Left to lean out, then Jump and press Interact to latch on. Again climb down, rappel down as far as you can, then drop to the ground. Lara staggers then takes a few steps back from the edge. Take a running jump across the next gap and latch onto the rough wall ahead. Climb up and around to the right until you can pull up onto the ledge above. Run forward toward the next gap, jump toward the wall ahead, then press Jump twice to wall scramble to the top. If you miss, there's a handhold below for Lara to grab, but later you won't have this luxury. 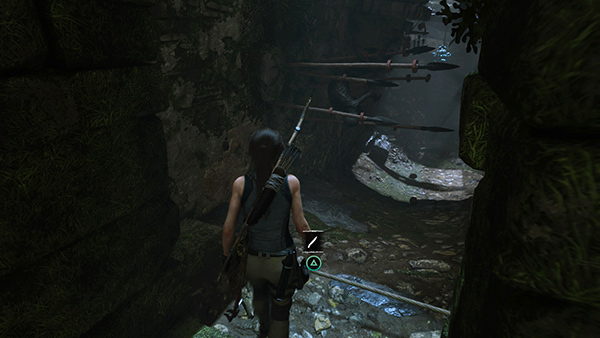 If Lara does fall to the lower handhold, just tap Jump twice to scramble up the wall and grab the ledge above. Lara says something about having to hurry, but she's exaggerating. Take your time. The bad guys will wait for you. Move to the end of the ledge, jump forward and grab the narrow ledge, then traverse to the right as far as you can. Climb down the craggy wall and then rappel down to the barnacle-encrusted section of wall below. Lara briefly loses her footing. Just stay calm, don't press anything, and she'll get it together. The game now tutors you in Wall Running: Alternate pressing A and D or Left/Right on the analog stick to run back and forth along the wall while maintaining a grip on your cable. When you build up some momentum, run to the right, jump, and grab onto the narrow ledge on the perpendicular wall. Climb to the right, then continue climbing downward and around to the right along the rough wall. 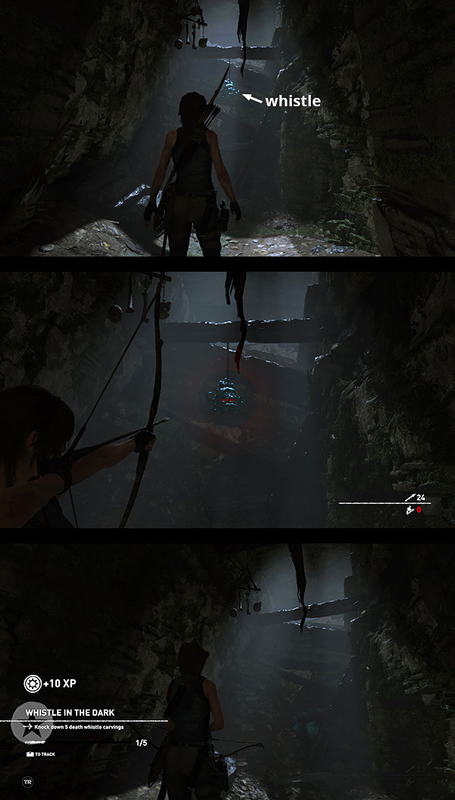 Lara notices a cave below. Rappel down until Lara is dangling as low as she'll go. Hold either mouse or trigger button, then alternate pressing Forward and Back to swing back and forth to Rappel Swing and build up some momentum. Aw Lara swings forward, jump and grab the ledge in front of the opening. Pull up. TEMPLE ENTRANCE: Climb into the opening and pick some orange fungi just inside on the right. (screenshot) If you check the Survival Guide, you'll learn these are Bolete mushrooms and will be useful later on for making Endurance Mixtures. In the same way that red vegetation is good for Health, orange ones are for Endurance. You won't unlock the skill that allows you to make these mixtures for a little while, but keep collecting ingredients. Next to it is a bona fide mural (1/2). Move close and press Interact to examine it. 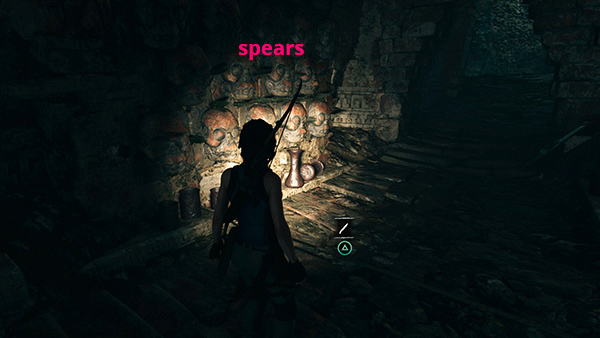 When Lara reads an ancient mural, she gains experience points (XP) and improves her knowledge of one of several Ancient Mayan Dialects, in this case Mam. 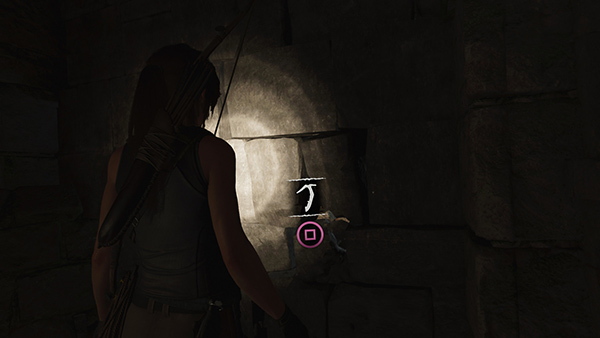 As you go, Lara will develop skill in three languages, enabling her to read more difficult ancient inscriptions. You can also learn a bit of lore that may help as the story unfolds. 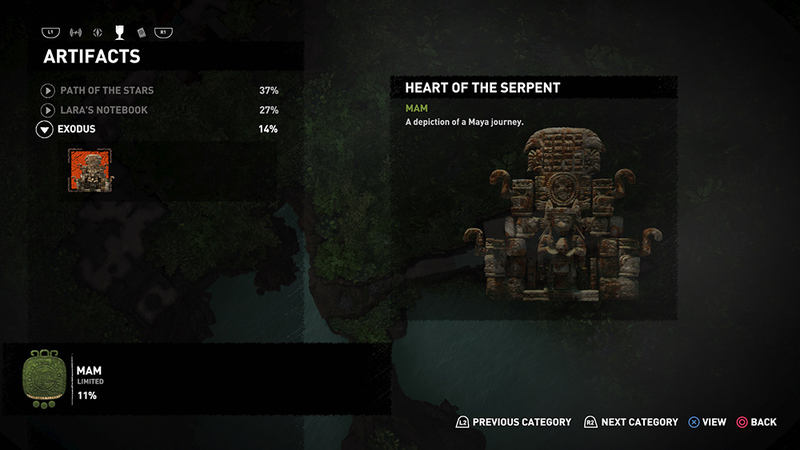 If you open the Artifacts menu now, you'll see that this mural, titled Heart of the Serpent, is part of the Exodus collection, or Story. (screenshot) Each story is made up of multiple collectibles, which may be scattered throughout the game. Finding all of the collectibles in a particular Story, earns bonus XP. 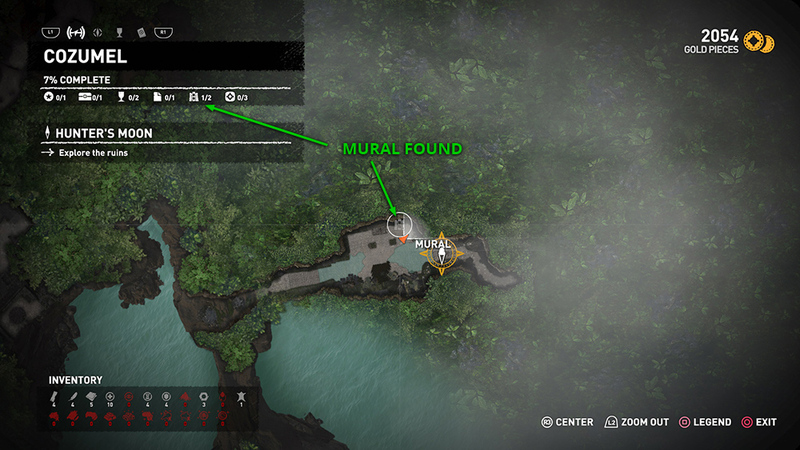 Also note that if you pass close to a mural (or other collectible) without examining it, it will be marked with a white icon on the in-game map. 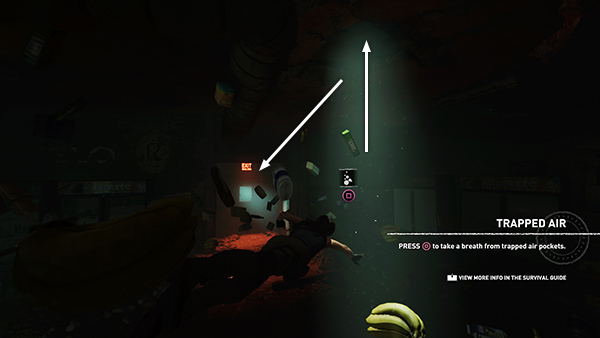 (screenshot) Once you have examined it, you'll see a grayed-out icon, and the progress bar at the top left will indicate 1/2 murals found. (screenshot) Later you can unlock a skill that makes murals and other collectibles glow in Survival Instinct view. Approach the door to the east for a tutorial on Rope Pulling. 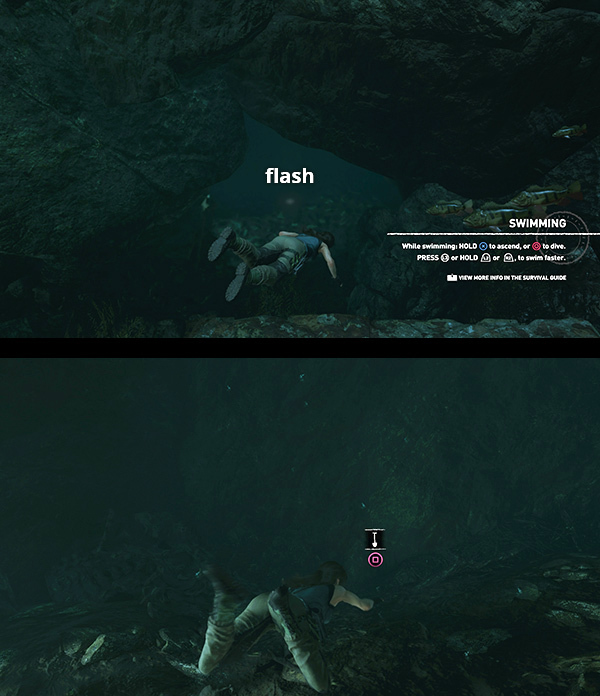 This will be familiar if you've played Tomb Raider (2013) or Rise of the Tomb Raider. (screenshot) Aim your bow at the rope-wrapped beam and the targeting reticle will turn red. Hold then release the Fire button to shoot a rope arrow and pull down the barrier. 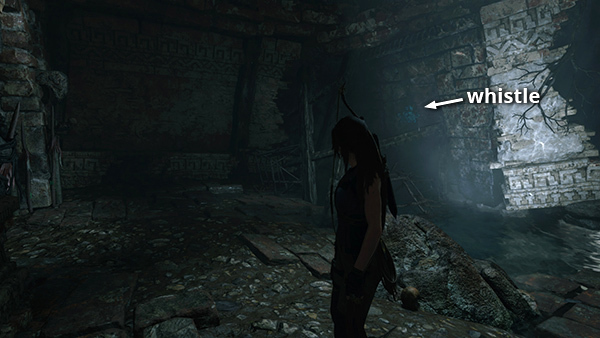 As long as you aim at the rope, Lara will fire a rope arrow and not a regular arrow. 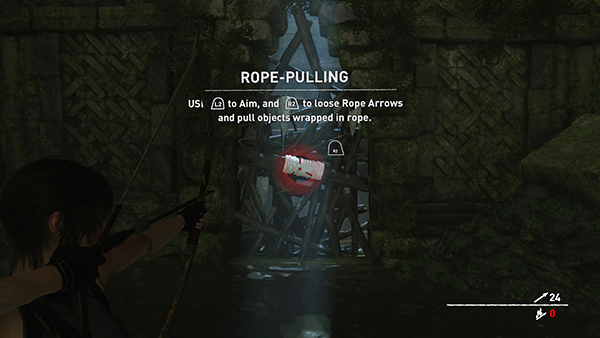 Rope pulling does not require or use up arrows. Beyond the barrier is a narrow passageway with a spear trap. Approach the tripwire carefully and press Melee to cut the wire an disarm the trap. (screenshot) If you miss this and trigger the trap, it's not deadly. The spears pop out from the right, but they won't hit Lara. Later, of course, you'll need to be alert for more dangerous traps. Press Duck + Forward to scramble under the spears. Just ahead look up and draw your bow to target the green ceramic whistle (1/5) hanging from the ceiling. Shoot it to initiate the first Challenge: Whistle in the Dark. (screenshot) Find and knock down 5 of these death whistle carvings to complete the challenge for bonus XP. Later you can unlock a skill that makes challenge items glow when you activate Survival Instinct. 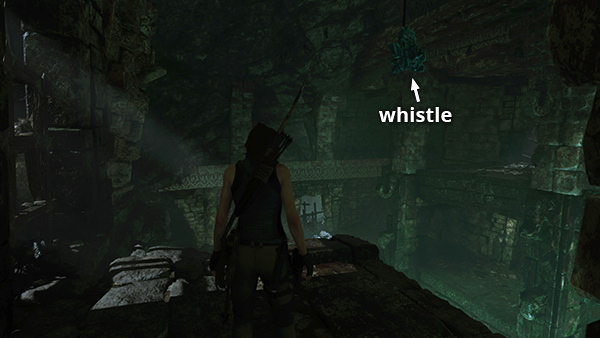 For now, if you have trouble spotting them, just check the screenshots and/or annotated level map, which has yellow dots marking the location of each whistle. Go through the low opening on the right and follow the tunnel to the next area. You'll meet some squeaky little rats along the way, but unlike the past games, Lara can't hunt them for rat kebabs. 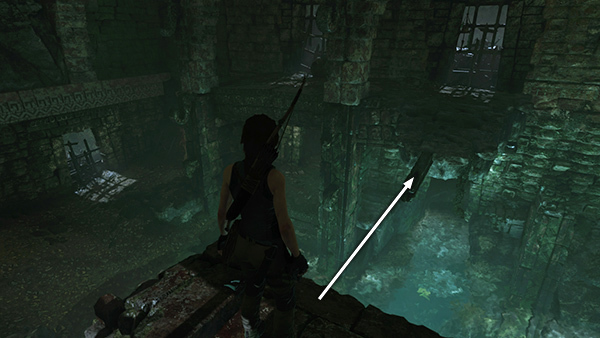 RUINS WITH POOL AND LEDGES: There are a few minor collectibles in this area: a supply canister just ahead on the right; 2 mushrooms, both on the left ledge; another supply canister in the cell on the left. Use Survival Instinct if you need help spotting them. There is also some stuff underwater, but you can wait to pick it up since we'll exit that way. Somewhere in here you'll gain a Skill Point. (screenshot) We'll talk more about skills when we reach the first Base Camp. Enter the cell near where you dug up the cache (southeast corner) and scramble up the left wall and climb onto the ledge above. (screenshot) Follow the passageway around to the left. There's a box containing a relic (1/2) sitting on the floor to the right. (screenshot) Again, if you pass by without noticing, it should be marked on your map with a chalice icon so you can find it later. (screenshot) Open the box to examine the relic, a Ceramic Jar, part of the Exodus Story. You can examine it further in the Artifacts menu to learn more. Lara also gains XP and a bit more skill in the Mam dialect. 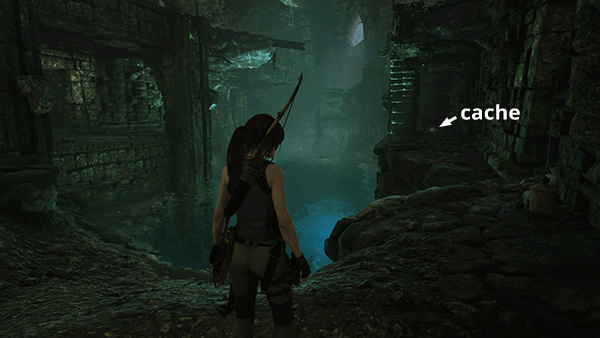 Move to the end of the ledge where you found the relic until Lara is overlooking the entrance. Here you'll find another ceramic whistle (2/5). (screenshot) You may have already spotted it from below, but if not, shoot it now for the Challenge. Then jump across the water onto the beam protruding from the opposite ledge. (screenshot) Loot another canister ahead on the left. Move to the other end of the ledge, jump to grab the horizontal pole (which glows in Survival Instinct), and swing over to the ledge ahead. (screenshot) Pick some mushrooms here. 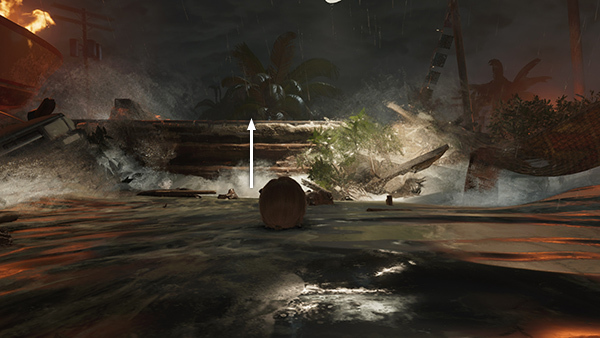 NOTE: All murals, documents, relics, survival caches, etc., are marked on the annotated level map. Each of the 5 whistles for the challenge are indicated with a star. POOL AND FLOODED PASSAGEWAYS: Now jump in the water and follow the Swimming tutorial. Hold Jump to swim toward the surface, Duck/Drop to swim downward, and the direction keys or left stick to move around. Hold either mouse button or trigger button (or L3 button) to swim faster on the surface or underwater. 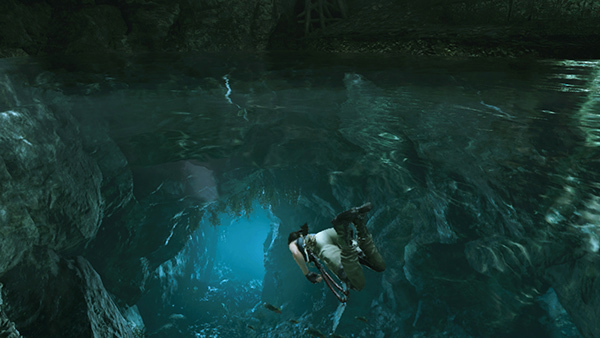 Lara can hold her breath for quite a while, but she's not invincible, so don't stay under too long. There's no air meter, so use common sense, and if Lara starts showing signs of distress, head for the surface immediately. Later you'll unlock skills to improve your swimming. There's a supply canister in the northeast corner and another survival cache (2/3) in a side cavern to the south. (screenshot) There's also a relic (2/2) on the bottom about halfway along the north side of the pool. If you face the trapezoidal doorway on the north wall and swim straight down, you'll find it. (screenshot) This is a Carved Bowl (Mam dialect/Exodus Story). Examine it closely in the Artifacts menu for a story-related clue. When you're ready to move on, take a deep breath and follow the blue-lit tunnel to the south. 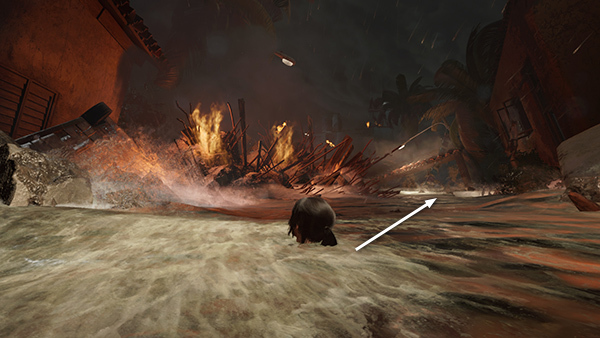 (screenshot) Hold either mouse or trigger button (or L3) to swim faster. Approach the narrow opening and Lara will swim through. You'll meet a moray eel here, but there's no chance to fight it yet. 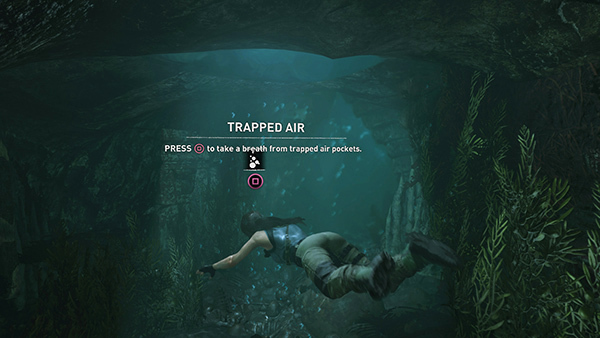 A bit farther on you'll come to a pocket of Trapped Air, and the game will prompt you to press Interact to pop up and take a breath. (screenshot) Continue following the tunnel, past a couple more eels, into a tight crevice. Just keep moving forward and Lara will handle it. Near the end, she'll become trapped, and you'll need to tap Interact repeatedly to get free. (screenshot) Then continue upward to glorious air! SECOND RUINED CHAMBER: When you catch your breath, loot another supply canister and take a look around. In the southeast corner is a ceramic whistle (3/5) that you can shoot down for the Challenge. (screenshot) In the northeast corner, sitting on a shelf, is an archivist map (1/1). 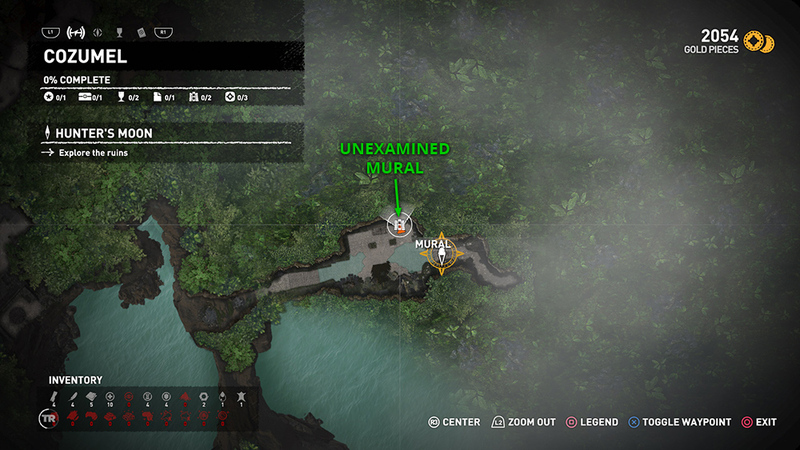 (screenshot) Examine it to reveal the location of several undiscovered collectibles on your in-game map. 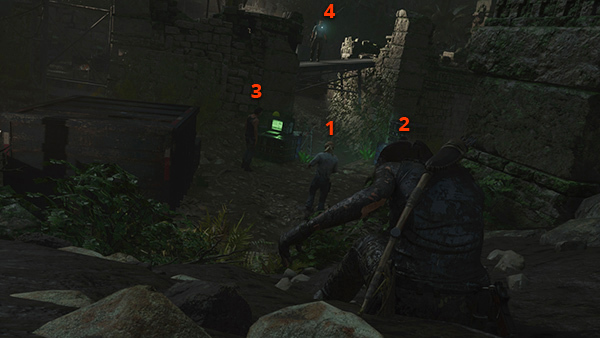 If you played Rise of the Tomb Raider, you'll be familiar with these maps. They aren't required for 100% completion, but they can certainly help achieve it, since they reveal any nearby relics, murals, documents, and monoliths. In the northwest corner is a braided rope barrier that you can't cut down yet. You'll need the REINFORCED KNIFE UPGRADE. (screenshot) You won't get it in this level, so make a note to return later. Or better yet, let me do it for you. See the section on REVISITING THIS LEVEL LATER IN THE GAME, below. NOTE: In case you're concerned, the big, bold text that appears near this first map and barrier will not be present later in the game. This is still a tutorial level, after all. Follow the passageway to the north slowly and carefully. 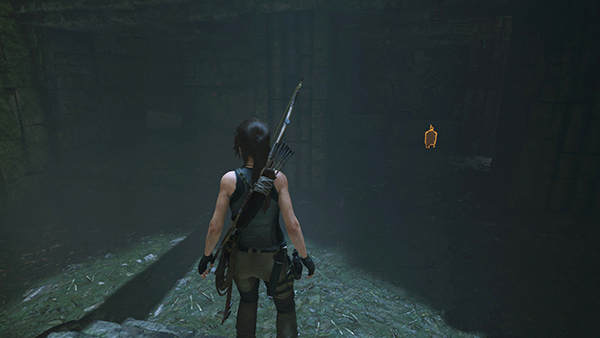 Lara should turn her light on automatically so you can see the spear trap ahead. Cut the tripwire (screenshot) and duck under the spears. (Or, if you accidentally trigger them, quickly duck and scramble forward out of the way.) Continue to a ledge above a spike pit. Jump across and latch onto the climbable wall. 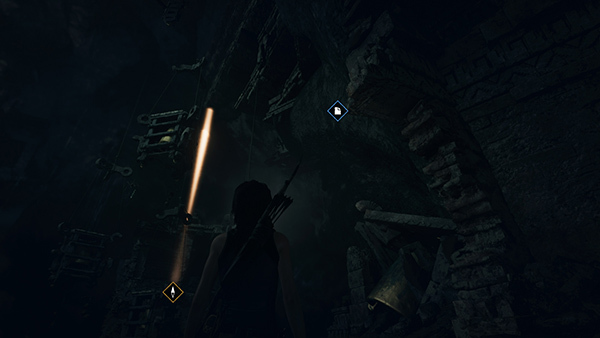 Climb to the top (screenshot) and step forward for a view of an impressive underground temple. As Lara and Jonah exchange info over the walkies, a shockwave set off by Trinity's blasting rocks the area. TEMPLE OF THE MOON: When you enter a new area where there are collectibles marked on your map, it's helpful to get a rough idea of where they are, since this can save backtracking. After reading the Archivist Map, we now have a mural and a document marked on our in-game map. Open it up and position the cursor over the document. 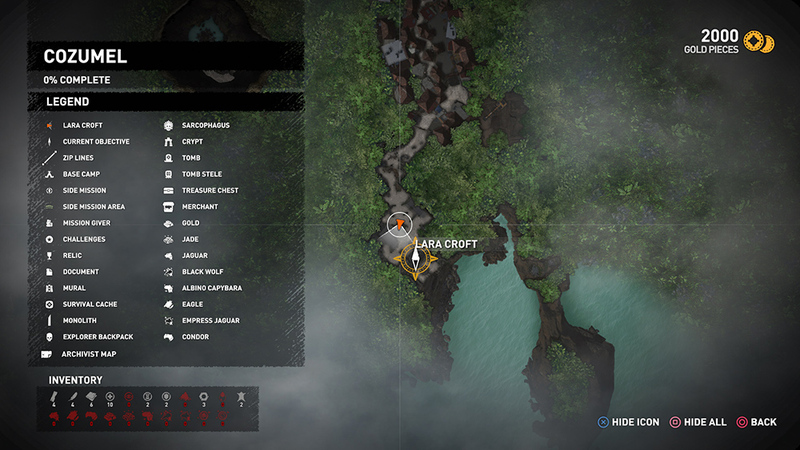 Then press the button indicated on-screen for Toggle Waypoint. This marks the document with a blue circle. (screenshot) Now, when you return to the game and activate Survival Instinct, you can see the document outlined in blue, high on a ledge above and to the right. (screenshot) You can't reach it yet, but this is helpful. If it were close by, you might have missed it in the dark. You can do the same with the mural, which is above on the left. Well reach both of them soon. 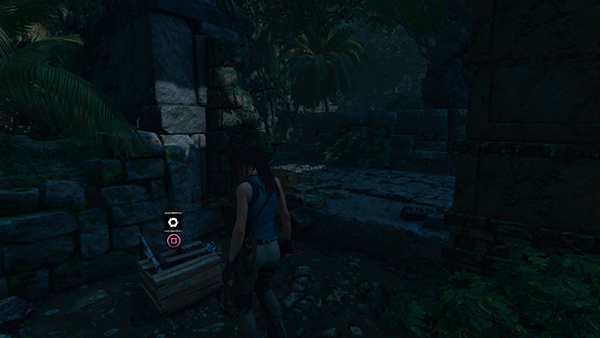 BUG NOTE: Apparently in the PS4 version, the stone slab in the section above may be missing. In that case, you'll need to jump out and grapple the ledge above by pressing Square. Then climb up the cable to grab the ledge. Lara raises Jonah on the radio and tells him about her find. She describes the mural above the dais: the Silver Box of Ix Chel...summoning the god Kukulkan...a series of cataclysms: tsunami, storm, earthquake, volcano. Lara then rotates the stone rings on the dais to correctly align the gems representing the stars of the Hydra constellation. The dais then rises, revealing a dagger and an inscription: "The key to Ix Chel's heart unlocks the cleansing." With Trinity about to arrive on the scene, Lara naturally ignores Jonah's advice and grabs the dagger. Whee...apocalypse inbound! Here we go! After the cutscene you have a new photo in the Artifacts menu: the Key of Chak Chel, another entry in the Path of the Stars Story. Follow the passageway forward. There are no splits or side passages so you can't get lost. There's another supply canister along the way. When you come to a dead end, you'll be prompted to press Interact repeatedly to break through the crumbling wall. (screenshot) Climb through the gap into the next area. Now that you've cleared the area, look around for supplies. Survival Instinct will help you locate some cloth (which you'll use later for crafting) and a box of supplies (screenshot), as well as highlight any un-looted corpses in case you missed something. When you're ready to move on, scramble up the painted stone wall where you threw the bottle earlier, then another wall above. 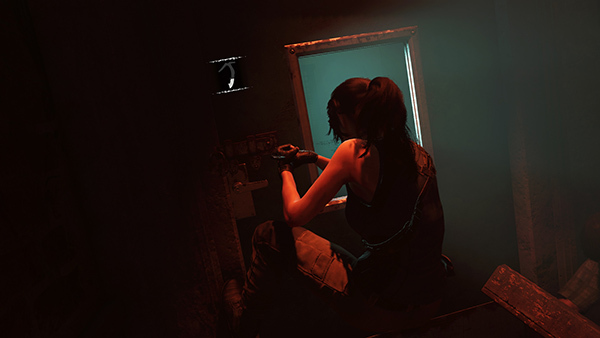 As she drops down into the next area, Lara spots 4 more enemies: 3 on the ground and one on the wall ahead and to the right. (screenshot) If you like a firefight, you can grab one of the bottles sitting on the boxes to the left and follow the tutorial that explains how to hold the Alternate Fire button (Middle Mouse/R1/RB) to combine the bottle with cloth from your inventory to Craft a Molotov. You can then throw it the same way you did the empty bottle to kill two of the enemies at once. Naturally the others will notice and you'll have a fight on your hands. If you're like me, you'd rather avoid combat as long as you can. When you've taken care of those three, a cutscene shows a helicopter arriving with reinforcements. When you've killed the last enemy, Lara will say, "I hope that's all of them," and stand up straight to show the danger has passed. You'll also receive a big XP award. Before heading to the exit, scour the area for useful items. Be sure to loot all of the enemies' bodies. They carry ammunition, various supplies, and gold coins. 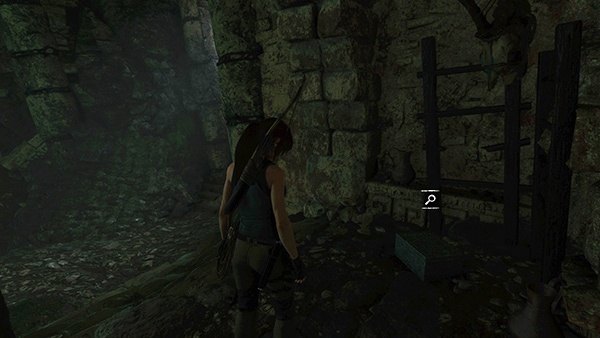 Survival Instinct will also help you locate 2 boxes of rifle ammo (assuming you didn't pick it up during the fight), some cloth, a first-aid kit and a supply box on the raised platform in the northwest corner, and another box of supplies in the alcove just to the right of the ornate metal gate. When you have everything, pry open the gate (screenshot) to leave the area and trigger a cutscene. Dominguez's men surround Lara and she's forced to surrender and give up the dagger. Dominguez admires the artifact, telling Lara he's sacrificed his life for the Key of Chak Chel. He then asks her where the Silver Box of Ix Chel is. Lara hesitates for a moment before bluffing, "It's in a safe place." Not the right answer. Apparently the inscription near the dagger was more than just a lot of superstitious hocus pocus. Apparently by taking the dagger without the box, Lara has triggered a "cleansing"—a series of disasters that will end with the death of the sun. Oops! Dominguez and his men retreat to a waiting helicopter and Lara is left alone in the street. Moments later the tsunami rolls in, as foretold. 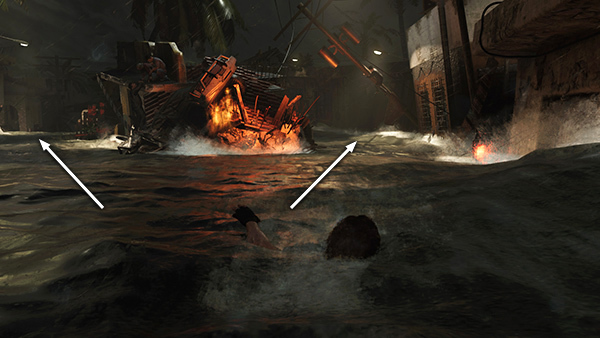 FLOODED STREETS: When you regain control of Lara, she's clinging to a post in the middle of the deluge. If you've played the Tomb Raider reboot, you're familiar with this twisted brand of whitewater rafting. Move forward to let go of the post, then steer around the flaming mass of junk. 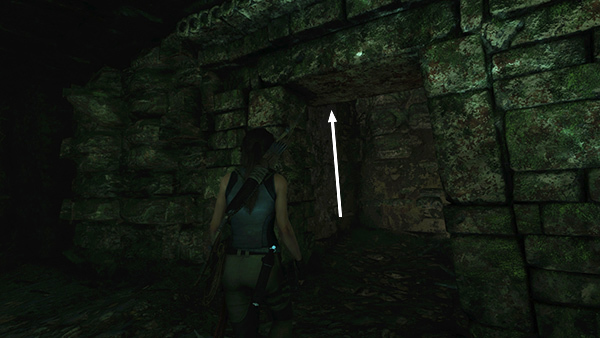 You can go to the left or right (screenshot), but if you run into it, Lara will die. 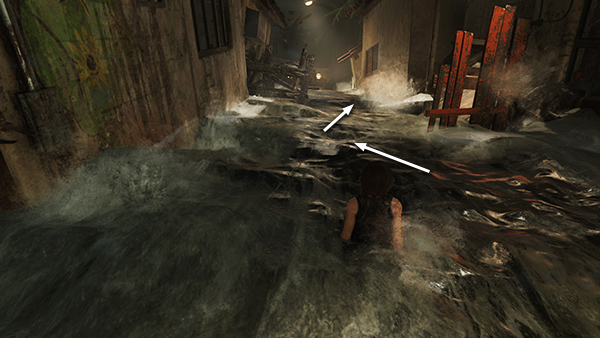 Regardless of whether you go left or right, the water will next carry Lara into a narrow alley with hazards on each side. Steer around them as the water carries Lara onward. (screenshot) You'll go over a small waterfall and under a bridge. Just keep steering around the obstacles as well as you can. When Lara slams into a fallen tree, there's a brief cutscene where she grabs onto some wooden shutters and attempts to hang on. When you regain control, press Forward to grab onto the next shutter. (screenshot) After that the game takes over for a bit. 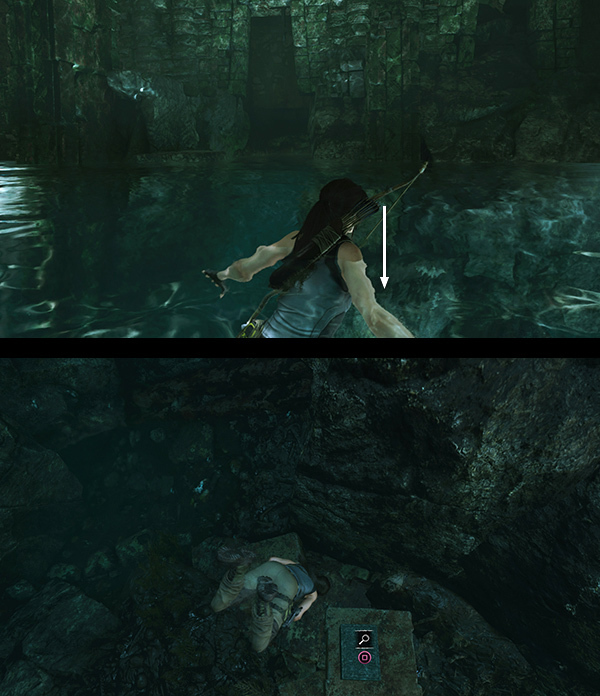 A bell tower crashes into the water nearby and Lara is sucked underwater. A short cutscene shows a boat barreling down toward you from upstream. 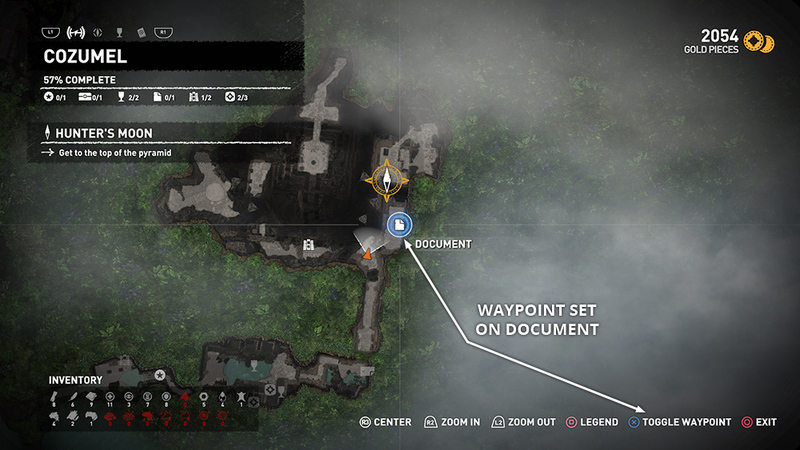 GETTING TO HIGHER GROUND: This section is pretty intuitive, but there are screenshots if you need them. When you regain control, start running and jump onto the slab of debris with white paint. Run to the end, jump, and grab the bent sign. Press Interact at the prompt to hang on. Then pull up on top of the sign. Turn left, scurry to the end of the sign, then jump onto the crane. Run up the crane arm and jump to grab the streetlamp, which swings around to the right, so you can jump onto the red-tiled roof. Slide down the roof onto another flat piece of wreckage. Run forward, jump to grab another streetlamp, swing forward, and jump onto a metal container that happens to be floating past. Before it can move too far downstream, run to the end and jump to grab the low wall ahead. 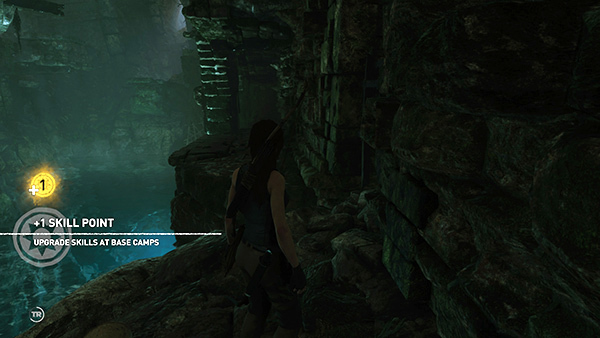 An emotional cutscene follows in which Lara is focused on her mission, while Jonah tries to make her see reason. They agree to stay and help the residents before setting off in search of the Silver Box. REVISITING THIS LEVEL LATER IN THE GAME: Even if you complete the Whistle In the Dark challenge and find every collectible the first time through the level, you will still be missing the Treasure Chest, which can only be opened with the LOCKPICK. So if you want 100% completion for this level, you'll need to return at some point. When you unlock the ability to FAST TRAVEL, two base camps appear here in COZUMEL: The Cozumel Cliffs Base Camp is located near the eastern end of the ruins. You can return there if you're missing any of the collectibles from that area. The Tidal Caverns base camp is near the entrance to the huge cavern with the pyramid. Any time after obtaining the LOCKPICK, in a later level, use fast travel to get to reach the Tidal Caverns Base Camp. By the time you get the LOCKPICK, you should also have the REINFORCED KNIFE UPGRADE. Both are available in the HIDDEN CITY. So if you like, you can follow the passageway to the south, jump over the pit onto the stairs below, and scramble under the spear trap to get back to the SECOND RUINED CHAMBER, where you found the Archivist Map earlier. On the right is the braided rope barrier you couldn't cut before. (screenshot) Cut it down now and follow the passageway to find some jade. If you're missing any items in the room to the west, you can cut down another braided rope barrier to get back inside. Otherwise, retrace your route back to the Tidal Caverns base camp. The COZUMEL CAVES area, where you begin the game, the TOWN SQUARE, and the DISASTER AREA are not accessible later on. There are no major collectibles there, though, so there's no need to go back. †UPDATE HISTORY: 9/12/18 - First draft of walkthrough posted online. Rough level map added and a few other minor tweaks made later the same day. 9/16/18 - Added note about missing stone slab in the area where you climb up before dropping down to the dais. Thanks to Briza for sharing this info. Also fixed a couple of left/right button mix-ups, thanks to Henry. 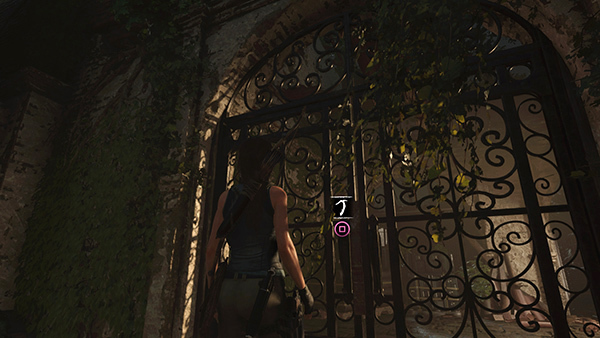 11/5/18 - Added link to the first Hidden City walkthrough from the section on "Revisiting this Level Later in the Game." 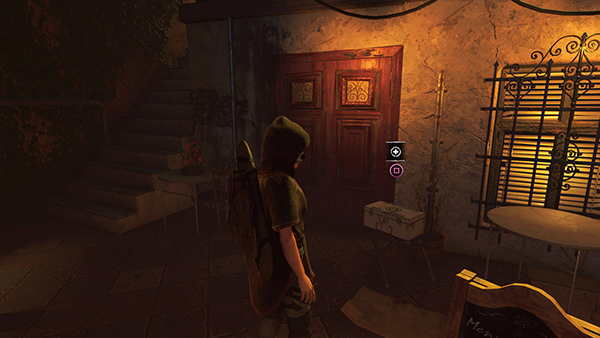 More information about obtaining the LOCKPICK and REINFORCED KNIFE UPGRADE are included in walkthrough for that level. 1/24/19 - Updated annotated map. Edited and added screenshots for the treasure chest sequence and made a few other minor tweaks for clarity.